Who says scientists can’t be creative? 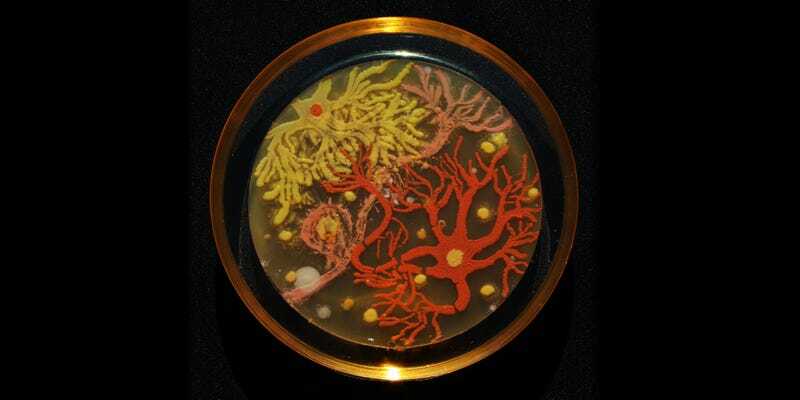 The American Society for Microbiology organizes an Agar Art competition, where researchers battle it out by creating artwork in a Petri dish—and these are this year’s winners. Neurons and biological shapes is a common theme in the works of the artist Maria Penil. Here she painted with yellow Nesterenkonia, orange Deinococcus and Sphingomonas isolated for their attractive colors as contaminants in the Berkmen lab. After growing the plates for 2 days at 30C, the artist usually lets the plate sit for few more days before permanently sealing the work in epoxy. We invited the public to learn about microbes by creating a city map using harmless Escherichia coli K12 bacteria engineered with colorful fluorescent proteins like GFP, RFP or YFP as paint. More than fifty participants applied bacterial suspension cultures onto square petri plates containing standard LB selection media. The plates were prepared with stencils of NYC’s street grid, allowing participants to paint the bacteria into the patterns. After a short incubation time, participants returned to print the grown colonies on paper. The organism used for this piece of art were metabolically engineered on the b-carotene pathway, resulting in a color palette of colonies of our choice, from yellow to red. The painting depicts a humble farmhouse with the wheat production laced in the countryyard. Amazed by the plasticity of this organism for engineering during the Yeast Genetics & Genomics Summer Course at CSHL I got inspired to paint this agar with the message: “Look at the Yeast field, for they are already white for harvest!”. You can explore all the entries —including ones made from poop — in the competition’s Facebook album. Some are wonderful, others suggests scientists may be better suited to science.